New Energy Times - Where Does the Energy Come From in LENR? Where Does the Energy Come From in LENR? (Source: New Energy Times) I describe this process in my article “Widom-Larsen Theory Simplified” as well as in the chapter I co-wrote with Joseph Zawodny of NASA for the Wiley Nuclear Energy Encyclopedia. In experiments with hydrogen, there is an energy cost of 0.78 MeV to create the neutron that initiates the reaction chain and each subsequent neutron that is used. This takes place in step 1 of the Widom-Larsen theory. In the case of deuterium, there is a cost of 0.39 MeV to initiate the reaction chain and each subsequent neutron that is used. Each of steps 2 – 4 in the Widom-Larsen theory release energy. 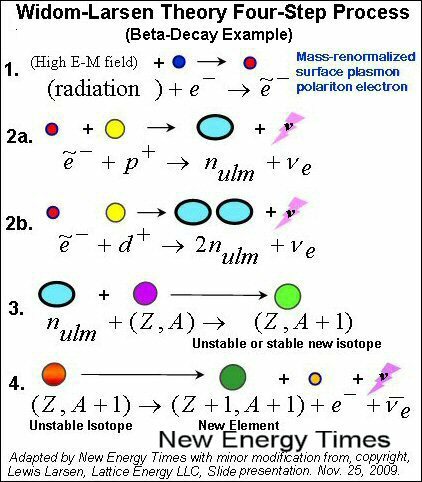 According to Larsen, these may include neutron capture processes (that create gamma rays which are converted into infra-red heat energy by nearby heavy electrons,) alpha decays, beta decays, beta-delayed neutron emissions and beta-delayed alpha decays among others. Different values of energy release are associated with each process and each set of particles involved in the reaction network. 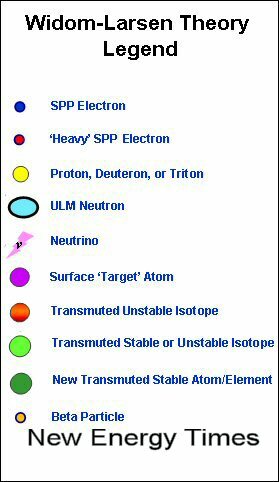 These are all well-known, conventional nuclear physics processes and the values can be found in textbooks and online tables such as the Brookhaven National Laboratory Q-Value Calculator. These reactions take place in a complex network of possible reaction pathways. 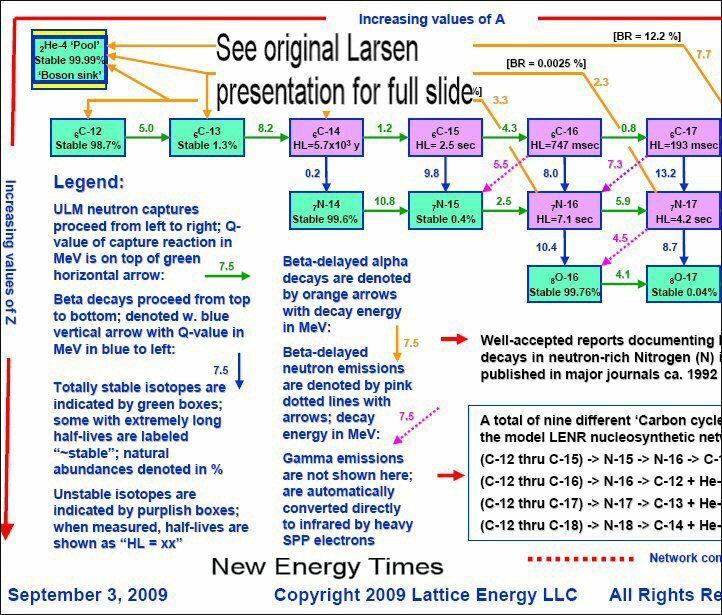 In the diagram below, taken from Larsen’s Sept. 3, 2009 slides, one of the many reactions shows a carbon-12 atom capturing a neutron and going to carbon-13. This releases 5.0 MeV of energy through the neutron capture process. 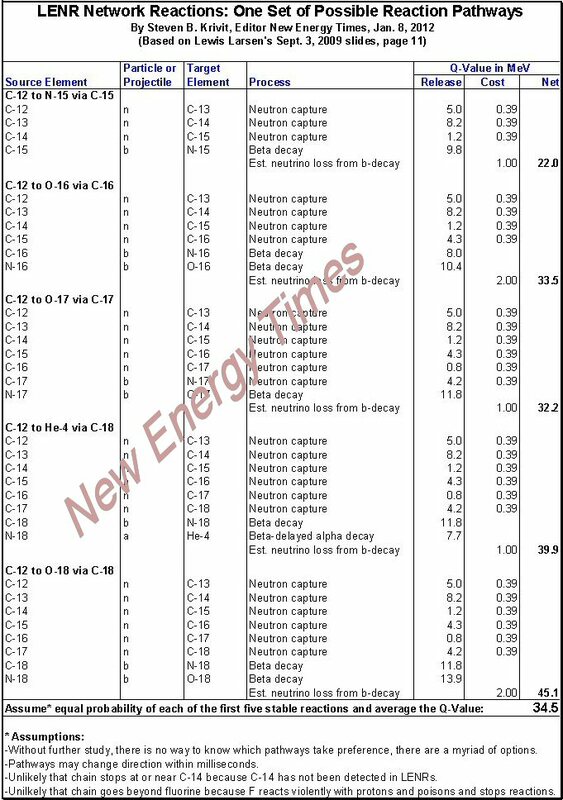 (Source: New Energy Times) But nobody has even seen carbon-14 in LENR so it is very unlikely that the reaction chain stops in the neighborhood of carbon-13 or carbon-14. If the reaction chain goes through seven steps, it can end up as helium-4, which has been seen many times. The final step in this chain shows nitrogen-17 undergoing a beta-delayed alpha decay to helium-4. This releases 2.3 MeV of energy in that single step. This particular chain, from start-to-finish, C-12 to He-4, via N-17, is only one of many possible pathways. In this network path, the total energy release is 39.9 MeV, which accounts for the cost of the neutrons. Readers who are ready for more may wish to look at Larsen’s Sept. 3, 2009 slides pages 11-12 and June 25, 2009 slides, pages 45, 46, 50 and 62-64. A good resource to learn about the Widom-Larsen theory is my WL Portal page. Here is another way to look at possible reaction reaction pathways, using the information in Larsen's Sept. 3, 2009 as a reference. (Source: New Energy Times) This set of reaction pathways is based on the SRI International replication of the Case deuterium gas experiment. The energy cost of 0.78 MeV is for creating the heavy electron which then reacts, depending on the experiment, with either hydrogen or deuterium to make one or two neutrons and a neutrino. If it reacts with a proton, the effective cost is 0.78 MeV per neutron. If it reacts with a deuteron, you get two neutrons for the price of one; 0.39 MeV per neutron.